So, I did this thing… It’s a little complicated to explain, but bear with me: I used a Software Defined Radio to capture the radio transmissions from a Bravo Ph esophageal monitor, wrote a browser-based decoder using the AudioData API, and reverse-engineered the broadcast data packets. As a bonus, I hope to do something similar to catch signals from a tiny satellite I helped fund on Kickstarter, which launches this weekend on SpaceX’s CRS-3 mission to the International Space Station. 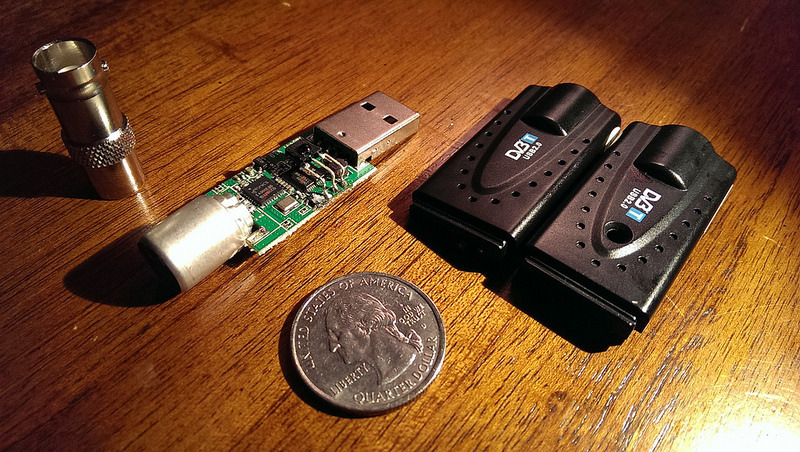 Software Defined Radio (SDR) is central to all of this. It’s a pretty complex field — and I am by no means an expert — but the simplified basics are not hard to understand. Traditionally, a radio is built for a specific purpose with specific hardware. It’s effectively a black box customized to convert audio/video/data to or from a particular pattern of electromagnetic radiation in some particular part of the spectrum. Each box is different; you need one for satellite TV, one for FM radio, one for WiFi, one for GPS, and so on. There are myriad variations, and devices that might seem similar can actually be completely different. You’ve probably seen news reports about police and fire departments who are responding to the same disaster, but are literally unable to talk to each other because their radio systems are different. SDR is a radical departure from all that. You still need a piece of hardware that can tune to a relevant slice of the radio spectrum, but it becomes a general-purpose device that relies on software to do all the application-specific bits. For example, you might ask such a device to tune to 66Mhz, and capture 3Mhz of bandwidth on either side. You then feed the result to a software NTSC decoder, et voilà, you’re watching TV (analog channel 4). The hardware doesn’t know anything about the contents of what it’s receiving, since it’s the software that deals with it. If your device can capture more bandwidth, you could even watch multiple channels at the same time. And since it’s just generic data being processed by software, it doesn’t need to happen in real-time. 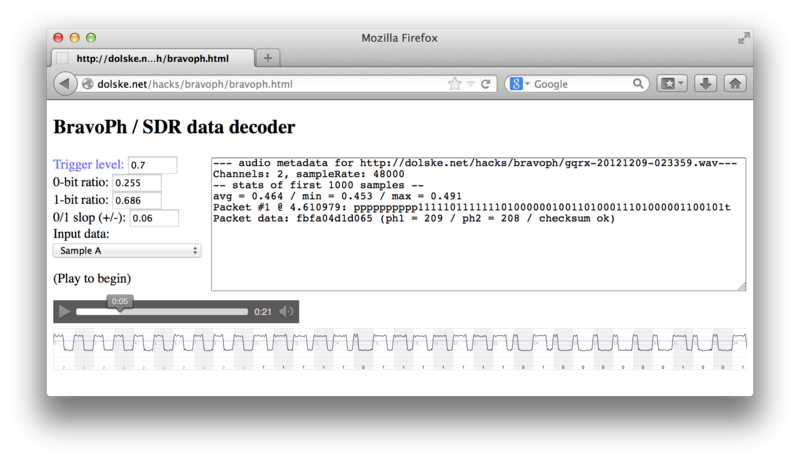 You can record a stream of RF data, and process it in different ways after the fact. 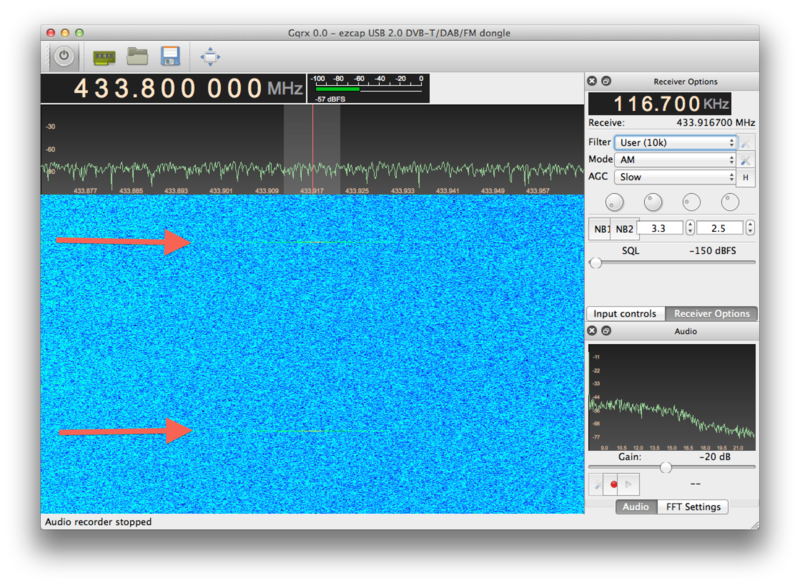 Until recently, SDR was only possible with fairly expensive equipment, which made it a niche hobby. 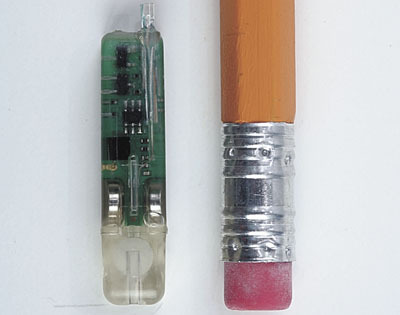 But in the 2010-2012 timeframe, some folks discovered that a cheap USB device intended for digital TV reception (“watch TV on your laptop!”) contained surprisingly capable hardware that could be repurposed as a general-purpose SDR. Specifically, the RTL2832U chipset and a variety of tuner chips. For $10 to $20 you could get one of these mass-produced dongles that, with the right software, let you receive and decode all kinds of interesting transmissions from roughly 50Mhz to 1800Mhz. Most obviously, listen to voice broadcasts: AM/FM, shortwave, air traffic control, police/fire dispatch, etc. Monitor aircraft traffic (position, speed, ID) in realtime by decoding ADS-B signals. Help crowdsource global coverage on flightradar24.com, or generate your own maps/tracking locally. Ditto for large ships and weather balloons. Decode location data broadcast by a news helicopter during a police chase. Listen to spacewalks on the International Space Station, or ham packet data bounced off the ISS’s repeater. Determine your position via GPS. Read your wireless electric meter or control a ceiling fan. Listen through another laptop’s microphone — even when it’s off! Crack poorly-encrypted GSM cellphone conversations (N.B., this is probably illegal!). Part 1, 2, 3, 4. There’s a whole world of analog and digital RF data being broadcast around us, which cheap Software Defined Radio hardware makes readily accessible. 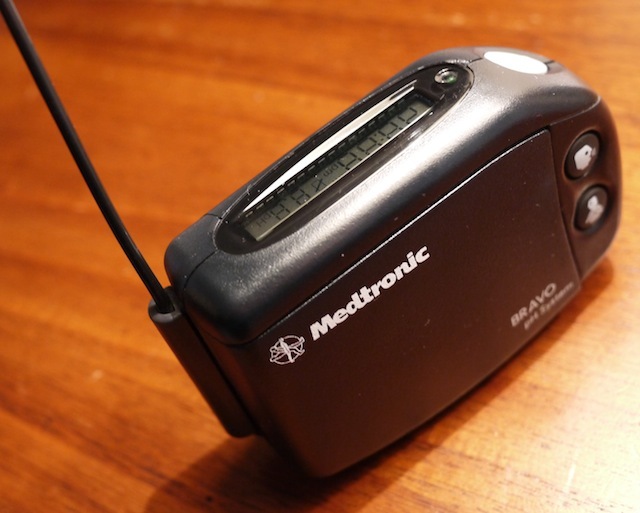 During the monitoring period, you carry around a receiver (which basically looks like a giant 1990-era pager). It’s supposed to be kept within 3 feet of you at all times, or else it makes an annoying beep when it loses the sensor’s signal. It records pH measurements every few seconds, and conveniently displays the last reading. When the study is over, you return the receiver, your doctor downloads the data, and you get a nice little report with graphs and numbers to help your doctor make a diagnosis. So that’s SDR and Bravo Ph. Now, if you’re connecting the obvious dots like I was, you’re wondering if it might be possible to snoop on the sensor’s broadcasts to see what they contain. Indeed it is! But the first step is finding the signal. A preamble consisting of 10 500μs hi pulses (each separated by 500μs lo). This likely serves as a clear “beginning of message” indicator, and to establish clock speed. 48 bits (6 bytes) of data. Each bit is 1 millisecond; with a “0” indicated by 250μs hi followed by 750μs lo, and a “1” indicated by 666μs hi followed by 333μs lo. A single 500μs hi stop bit. I decoded a few packets by hand, both for fun and to validate the format. But it quickly became tiring to scribble down data like “pppppppppp111110111111101000000100110100011101000001100101s” and then convert it to hex (fbfa04d1d065), so I decided to write a tool to do it. 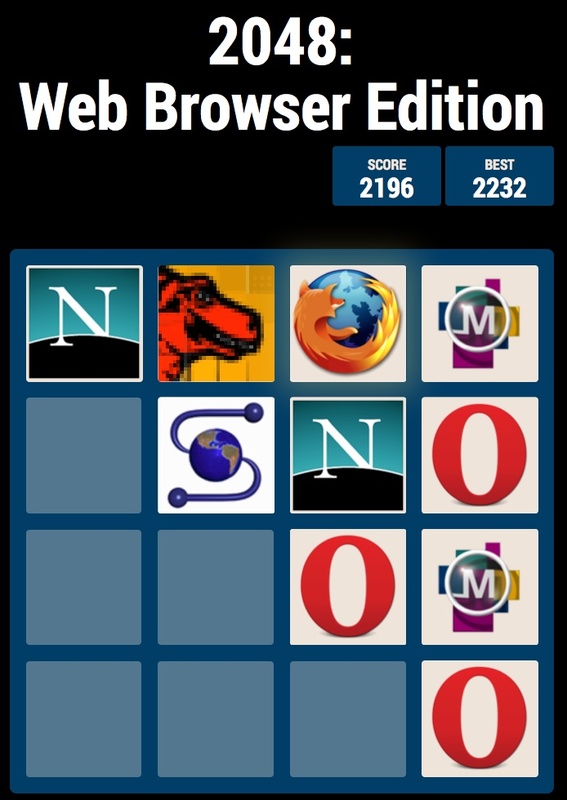 In the browser, of course! The first 3 bytes (0xFBFA04) are always the same, so that’s presumably a serial number or unique ID (and the manual confirms that during setup, there’s a step to ensure that the receiver is getting the expected sensor ID). The next two bytes must be the actual pH measurements. 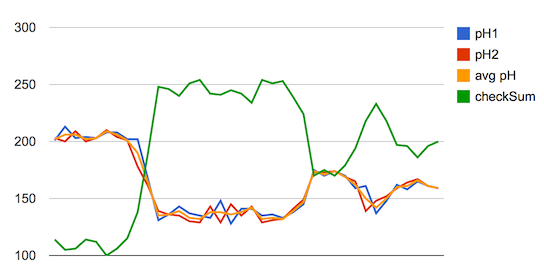 They are usually similar to each other, and by graphing the values I can see they follow the trend of the pH values reported on the receiver (which I was writing down when capturing the transmissions). Why two values? The manual says that a measurement is made every 6 seconds but a transmission only every 12, which I assume is done to save power. The pH is roughly obtained by dividing the byte’s value by 25 — but it looks like it’s somewhat non-linear or uncalibrated, as data for the lowest pH values needs to instead be divided by 30 to match what the receiver reports. The checksum value (green) looks like a stretched, inverted, and offset version of the average pH (yellow). How about (pH1 + pH2) ^ 0xFF + 7? (All modulo-255, since this is likely an 8-bit microcontroller.) That’s it! It correctly generates the observed checksum for each of the 144 packets I captured. So with that, I’m able to decode, interpret, and validate the data packets. Neat. It’s not directly useful for anything, but made for a fun experiment. Patent US6689056 has a number of interesting tidbits. It indicates that the microcontroller in the sensor is probably a MicroChip 12C672 (a member of their PIC family, which is similar to the Atmel AVR family familiar to Arduino folks). There’s a basic description of the packet format, but the only detail I hadn’t caught was that the 3-byte header is actually a 2-byte ID and a 1-byte Message Type (I only ever saw one type). It does confirm that the last byte is a checksum, but doesn’t go into how it’s computed. On the FCC’s website, I found a 4/25/2001 application from Meditronics for the PHZ-BRAVO100, which has a number of close-up photos and an extremely detailed Test Report. It basically confirms what I had found, with additional info on the bit timing and packet format, and also reveals that there is a “transmitter status” message type that’s sent once an hour. Now let’s shift from inner space to outer space — or at least low Earth orbit. Back in November 2011, a fascinating project appeared on Kickstarter: “KickSat – Your personal spacecraft in space.” Usually satellites are large vehicles that cost millions, but recently this has been made more affordable by using the small, standardized Cubesat format (a 10cm cube, weighing 1.3kg). 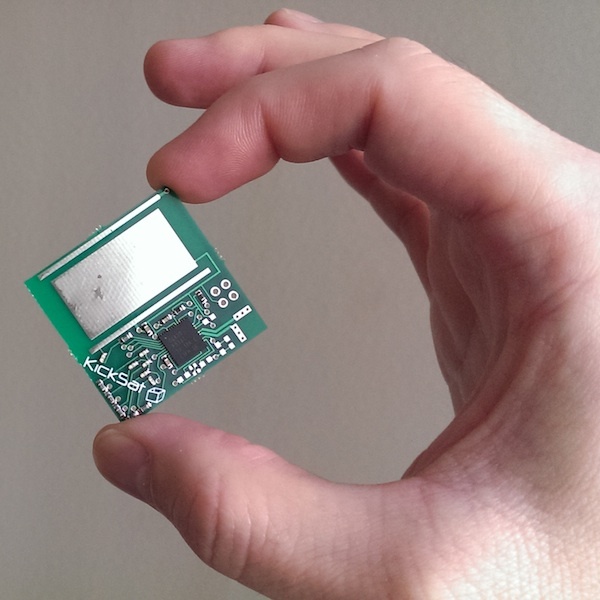 KickSat takes this a step further, by packing a Cubesat carrier with tiny “nanosatellites” (3cm square, weighing a few grams). That brings the cost down to just $300 to sponsor a KickSat in orbit, broadcasting a custom callsign and other simple data. They don’t do much, but it helps demonstrate the concept of using a fleet of cheap, simple sensors instead of a single expensive “Cadillac” spacecraft. 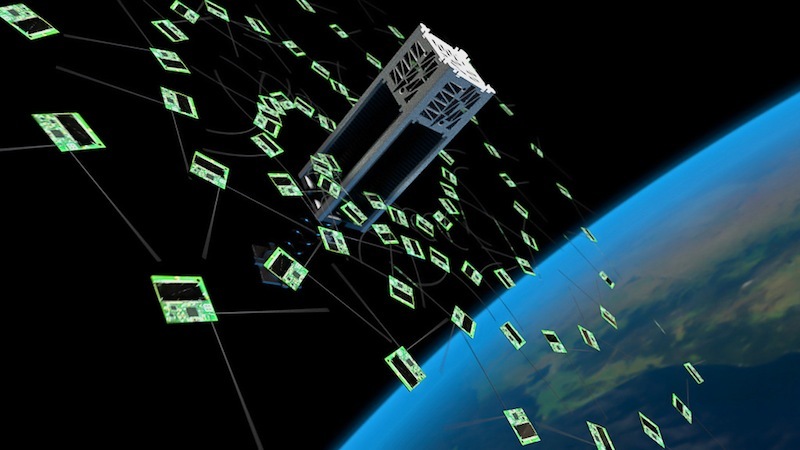 For example, instead of predicting space weather using reports from a handful of satellites, you might use a huge number of cheap nanosatellites monitoring a wide area. The project is publishing info about the satellite’s transmissions, as well as info on how to set an inexpensive ground station using… That’s right, software defined radio (GNURadio + RTL2832U dongle). I’ve got my equipment ready, and will attempt to capture signals from KickSat while it’s in orbit. More on that after launch!